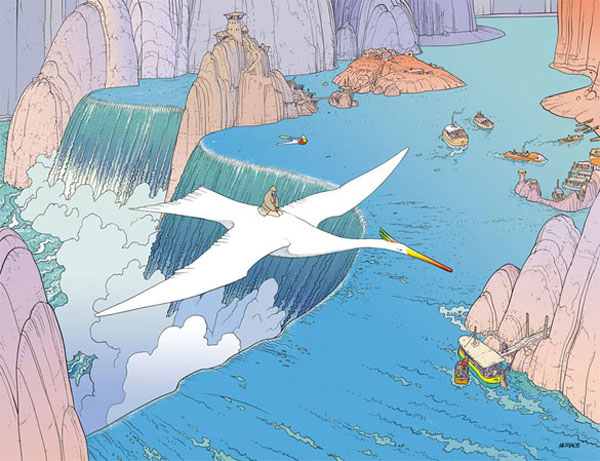 While twice a week, Making A Mark gives an insanely talented artist some IADW brag-space, today goes to honouring Jean "Moebius" Giraud. An icon of surrealisim and imagination beyond what print, film and media can handle, who having passed away, is now able to take his inspirational talents to a whole other audience. A French artist whose career started at age 18, Jean took you from extreme realism to surrealism, sometimes in the space of a page, sometimes in the same frame. As his imagination outgrew, but always majored in print, he mixed his work on comics like The Airtight Garage, Arzak and the Silver Surfer alongside Stan Lee, with providing concept art and style for flims like The Fifth Element, Tron, The Abyss and Alien. Earning the pen-name 'Moebius', Jean co-founded the European magazine Metal Hurlant, whose English incarnation Heavy Metal has proved just as inspirational to legions of aspiring creative minds. Some key artists ranking amongst the heavily influenced include Frank Quitely, Francesco Francavilla and Travis Charest. The first time I discovered Jean's art was in 1990, where Marvel had commissioned some guy named "Moebius" to create a series of posters. One featured Wolverine, sure, but the others starred the likes of Daredevil, Elektra and Iron Man (who wasn't as big back then) - it was like they'd hired a guy just to illustrate my top characters! Best of all, the one he nailed better then any other in the series was my pick of Marvel's crop too - the ever-lovin' blue-eyed Thing! 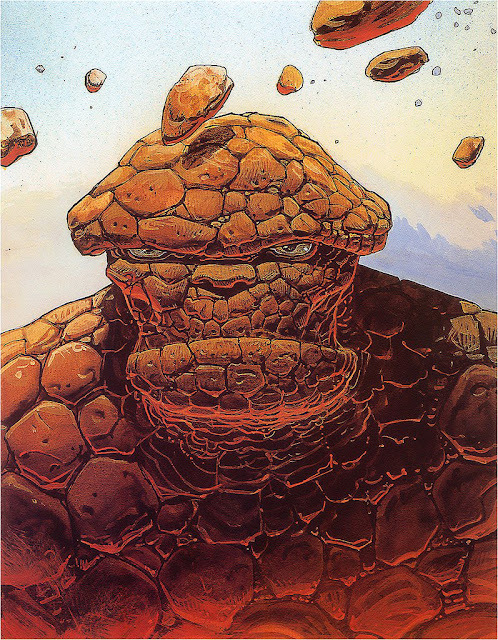 Not since Jack Kirby or John Byrne had The Thing been rendered so definitively - all while standing still. The texture / detail of his craggy physique, combined with the way he stands teary-eyed and steadfast while rocks rain down on (or are hurled at) him, summarised the heart of the whole character in a visual it's hard to break the gaze of. What does Jean's passing mean to you? Let me know in the comments section below. To see Jean's gallery exhibition transe-forme at the Fondation Cartier, Paris, click here, or to view the best examples of Giraud's legacy, visit theairtightgarage.tumblr.com after the jump. A very sad day for comics. A heavy blow for humanity's imagination. 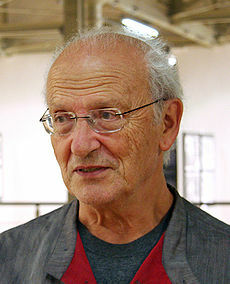 One of the reasons Metal Hurlant was launched was because creators like Giraud quietly worked from the assumption that the medium must be made to fit the needs of the artist and not the other way around. Graphic novels had been around in France since the late 60's at least, but the need for a regular periodical anthology that would bring a dedicated audience of returning readers to new artists was sorely needed. To this day it still has no true counterpart online despite numerous well done webcomics. The online version of Dark Horse Presents came close with its variety, but never established the brand identity that Heavy Metal has here in the US. I can always dig through my boxes and get lost in Azrach or Ciguri or a Blueberry western landscape, but where do I go to find that world where the need for entertainment media to convey an artist's ideas as faithfully as possible isn't a point that has to be argued, but just a naturally presumed fact? Jason, very true words indeed. PBL, I like the variety in HM too and down under does it not only have little competition, it is now scarcely available. Usually stores that carry it still usually also carry 2000AD, and those books can often have a range of artists too, just not on the same scale. awesome posting in terms of what you shared about the career of Moebius! his work always reminded me a lot of the alien landscape concepts of Roger Dean who i really like. 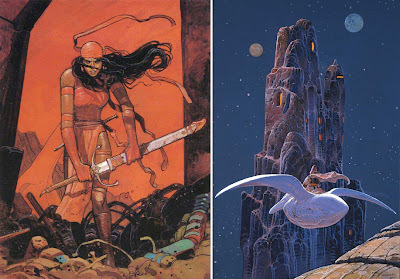 between Moebius and Ralph McQuarrie that's two legendary artists now in the comic book/sci-fi genre we've now lost this week. bullocks! Yip Dave, sadly tragic events seem to go in groups. Hopefully this will be the last for a long while!